What is the secret to revolutionizing your lifestyle and walking in Heaven’s supernatural wholeness? It’s simple: taking your journey one day at time! When Beni Johnson began her journey to health, God gave her grace to customize user-friendly plan that would help her achieve maximum results. This same grace is available for you! Too many people try to make dramatic changes to their health through fad diets, seasons of intense exercise, and other extreme measures. Unfortunately, these methods will never bring about the essential lifestyle changes you are looking to achieve. 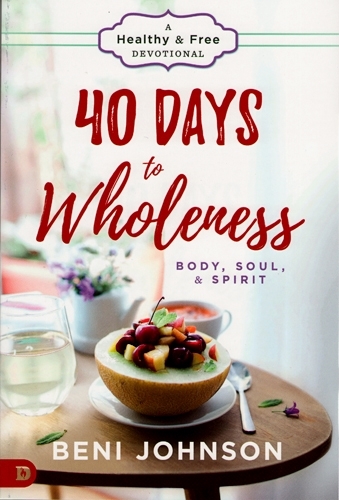 In the 40 Days to Wholeness: Body, Soul, and Spirit devotional, Beni shares practical strategies in daily, bite-sized entries that will help you successfully begin your personal journey into renewed health, sustained wholeness, and measurable results! Beni Johnson is a bestselling author, pastor, and conference speaker. Together, she and her husband, Bill Johnson, are the Senior Overseers of Bethel Church in Redding, California. 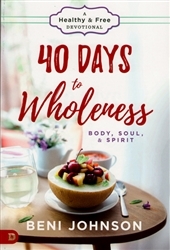 Beni has traveled all over the world bringing a message of joy, intercession and now, health in body, soul, and spirit. Beni is a mother to three children, along with their spouses and the grandmother to nine grandchildren.